We were in need: the propeller was inoperative and Petersburg, long our refuge, was unable to help us. We needed to have Wings lifted from the water so that we could repair our propeller, and we had a long laundry list of items to fix and repair. 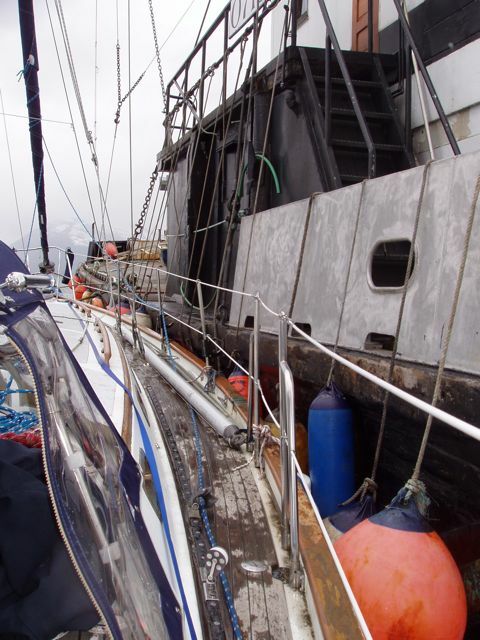 Getting to Wrangell was our best bet for getting hauled from the water so that the prop repair could be accomplished. 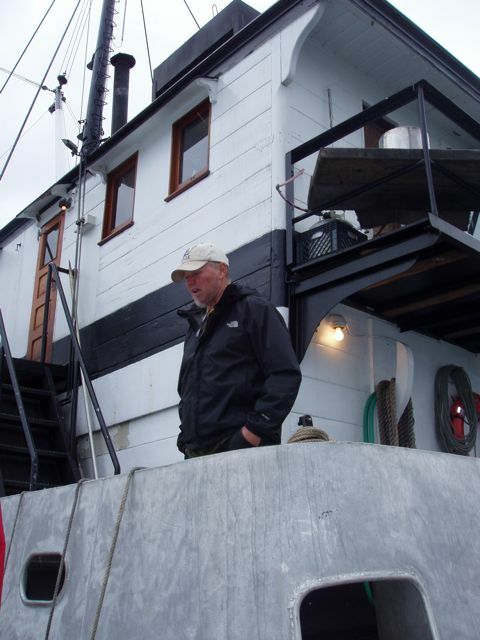 Glo, the Petersburg harbor master, asked Captain Hans if he would tow us to Wrangell since he was going that way. He was willing and with a 120 foot tender, little Wings would be no problem. Hans' willingness to help people that he did not know was another example of how people of the sea are willing to help others: what goes around, comes around. We'd like to thank Captain Hans, his daughter Amber, and Jared, none of whom we actually got to know. It's serious business towing someone else's vessel, and we all behaved as professionally as possible. Wherever you are, Deer Harbor II, we owe you a lot and wish you all the very best. Pow-wow with Captain Hans. Hans has owned Deer Harbor for many years. 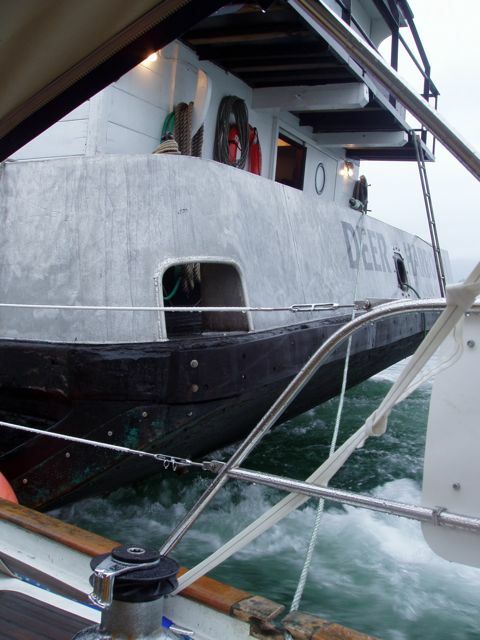 Deer Harbor II's stern showing tow line. Deer Harbor II's wheel house is inside the wooden door. 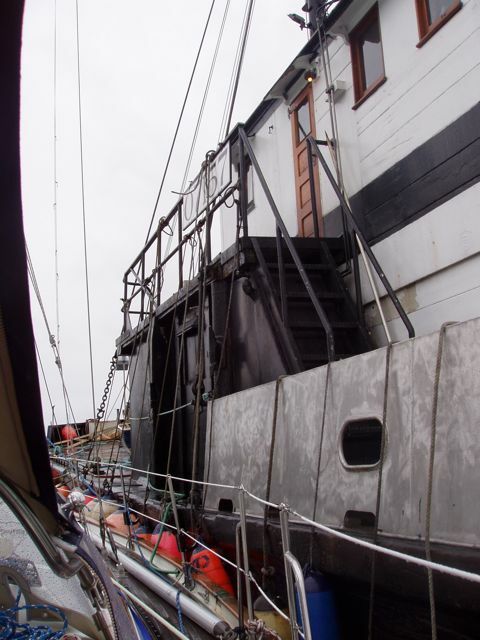 She's a wooden hull with steel top decks. She's a "tender", offloading fish from fishing boats and relieving them of the trip to and from the fishing grounds. She delivers fuel and groceries to boats with whom she has contracts. Deer Harbor was heading for Canada for retrofit.